Soochipara Falls or the Sentinel Rock Falls are nature's masterpiece with water cascading down 200 meters from over a cliff in three tiers.It has lush green cover around and thus offers opportunities for treks and even rock climbing.Wildlife can be spotted while moving on the trek routes.Carrying plastic is prohibited and tourists are strictly made to dispense with plastic bottles etc. at the base itself.A well laid path and steps take you to the bottom of this magnificent waterfall. 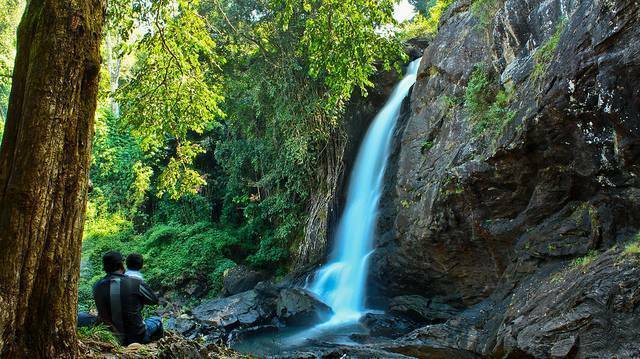 The falls can be reached in a 15- 20 minute drive from Meppadi. The drive offers an unbelievable view of the tea estates. A well laid path and steps take you to the bottom of these magnificent waterfalls.